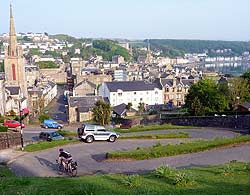 One of Britain's strangest roads is in Rothesay, on the Isle of Bute off the west coast of Scotland. The Serpentine Road was built when the town boomed as a Victorian resort, its ten hairpins enabling the horses to carry building materials up to the manor house on top of the hill. Or so the bloke in the pub down the bottom told us, anyway. A curious biking experience either up or down, it's much more exciting than the much-vaunted 'crookedest street in the world' Lombard St in San Francisco. It's twistier, and it's two way, plus you don't have all the gawping tourists. London's twistiest bike path is on the Ornamental Canal just west of St Katharine's Dock by Tower Bridge, while the twistiest road in England is said to be Zig Zag Hill, part of the B3081. But neither offers what Rothesay (right) offers, which is superb Victorian architecture, a restored Victorian public toilet in posh marble, stunning views, and a fish and chip shop owned by relatives of Lena Zavaroni. Ha! Take that, San Francisco! Google's Street View vehicle heroically ascended the road, and on one of the views you can see a cyclist pushing wearily upstairs. Nice cakes at Craigmor pier too. 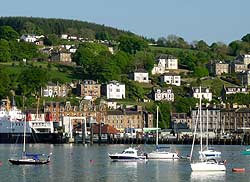 I went to Rothesay on my honeymoon. Unfortunately my Brompton had been detained at Kinetics shop in Glasgow. It used to spend extended visits there till I gave up and just mended it myself. Here it is in OSM. Still some work to do by the looks of the non-connecting nearby footpaths. I nominate the road leading NE out of [url=http://maps.google.com/maps?q=Inverfarigaig,+Inverness,+Inverness-Shire+IV2+6,+United+Kingdom&ie=UTF8&hl=en&cd=1&geocode=FbYKagMd8Aa8_w&split=0&sll=37.0625,-95.677068&sspn=23.875,57.630033&hq=&hnear=Inverfarigaig,+Inverness,+Inverness-Shire,+United+Kingdom&ll=57.282093,-4.452531&spn=0.002459,0.008208&t=h&z=17]Inverfarigaig, Loch Ness:[/url] steep and very twisty, a real road (ie made for the purpose of going from A to more distant B), not a tourist attraction - it's a little gem. @hercule - Here's the link you gave. Yes, that looks nice and twisty. (Hint: To include a link in Blogger comments, type in HTML directly. Here's a short tutorial. But spammers should note that such links won't help your search engine rankings). Zig Zag Hill was mentioned in the post, and it is a corker. Google Street View also climbs up that one. Clearly they have a thing about serpentine ascents. There's lots more examples of twisty thoroughfares discussed on a forum on the delightful roads website SABRE (www.sabre-roads.org.uk).